While other guys his age are focussed on things like seeing the world (if not raking in the a�?moolaha��), Karthee Vidya, 29, has made it his lifea��s goal to get a�?every Indian to volunteer at least once a month.a�? Before you break into your a�?isna��t that cutea�� smile, be aware that the man has already recruited 8,500 volunteers from across India to his cause. And as youa��ve guessed by now, therea��s a story behind the ambitions of Vidya, who hails from Arni, a small town in the Tiruvannamalai district. a�?After completing my 10th standard in Arni, I did my higher secondary in Chennai. This is when I experienced the vast differences in the schools of rural and urban areas. I decided that I must do something to bridge the gap,a�? explains the youngster, who started volunteering during his days as an engineering student at Government College in Salem. Vidya was placed in an IT company in Chennai and started Team Everest during his first month on the job. 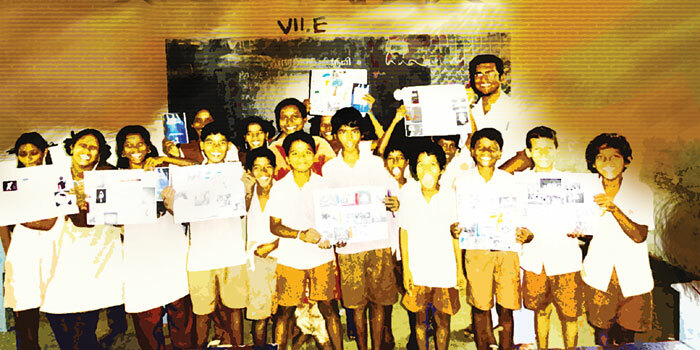 a�?Me and a small group managed to round up Rs.4,000 to help the school children in a village,a�? he recalls the first effort of Team Everest, that since 2006, has supported 200 college and 400 school students, to complete their education. The group, whose focus is to spread the message of volunteering, especially among children, has partnered with the Chennai Hub of Global Shapers for the third edition of their initiative, Contest for a Cause. a�?This is an online initiative that encourages you to contribute,a�? explains Vidya, who was selected as a Global Shaper about three months ago. Elaborating on the contest, Vidya shares that this year, it offers a total prize money of around `5,00,000 for winners of five competitions (drawing, story writing, photography, short film, poster design). The catch is that the winners will contribute their prize money towards a cause a�� this yeara��s being to set up 100 libraries. a�?We are partnering with Pratham Books, who promote the concept of libraries in the classroom,a�? Vidya says, adding that the libraries will be inaugurated by March 2015, by the winners who will be announced on December 6. In case you were wondering, they will be setting up the libraries in the suburbs of Chennai, Coimbatore, Hyderabad, Kochi, Bangalore, Kolkata, Mumbai and Ahmedabad. Aside from the contest that takes place during the Joy of Giving week, Vidya hopes to start a�?kindness clubsa�� in schools, to promote a�?service learninga��. But about his more immediate project, Vidya says, a�?My home in Arni is being converted into a computer, yoga and study centre for students there,a�? referring to his 1,500 sqft home that has sheltered his family for 40 years. a�?It will be opening by December and wea��re calling it Mom-Dad Community Centre,a�? he adds. Though getting every Indian to volunteer regularly may be distant, given our fast-paced life, wea��re glad people like Vidya are at least trying. The Shapers are an international network of city-based a�?hubsa�� whose members are between 20-30 years old. With service as their motive, these youngsters undertake projects for the welfare of their community. Some of Chennaia��s Shapers, who are all selected through a series of interviews, include human rights lawyer Gulika Reddy, Asian sailing champion Rohini Rau and theatre personality Krishnakumar Balasubramanian, among others.